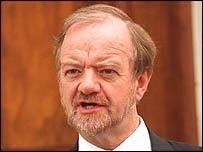 Robin Cook has won an unprecedented standing ovation in the House of Commons after telling MPs why he resigned from the government over the looming war with Iraq. Mr Cook said he could not back a march towards a war that did not have international and domestic support. In a Commons statement that followed his resignation as leader of the House earlier on Monday, he went on to warn that international alliances of all kinds were under threat now that the diplomatic route had been abandoned. Mr Cook, who had been a Labour front-bencher for 17 years, added that despite his resignation he wanted Tony Blair to continue as leader of the Labour Party and as prime minister. But he said that he would vote against the government's stance on Tuesday. "Neither the international community nor the British public are persuaded that there is an urgent and compelling reason for this action in Iraq," he said. The resignation is seen as a blow to Mr Blair coming just hours before he is due to ask MPs to authorise the use of "all means necessary" to disarm Iraq. Mr Cook said that Iraq's military strength was less than half what it had been at the time of the last Gulf War. It was illogical to argue, therefore, that Iraq presented a threat and moreover that that threat justified war. Furthermore, he said, Iraq probably had no weapons of mass destruction in the "commonly understood" sense of being a credible threat that could be delivered on "a city target." He drew a comparison over the impatience shown with Iraq over its failure to comply with the will of the UN and the situation in Palestine. "It is over 30 years since resolution 242 called on Israel to withdraw from the occupied territories," he reflected. The former foreign secretary went on to express alarm that the US administration seemed more interested in regime change that in Iraq's disarmament. "What has come to trouble me most over past weeks is the suspicion that if the hanging chads in Florida had gone the other way and Al Gore had been elected we would not now be about to commit British troops," he said. The BBC's political editor, Andrew Marr, called Mr Cook's performance "without doubt one of the most effective brilliant resignation speeches in modern British politics". He said MPs applauding one another was "simply not done" and there were "pretty sick faces" among the ministers on the front bench. "Its effect will be to rally the dissenters, the people who are going to vote against war tomorrow." The government has blamed the decision to abandon further attempts to win additional UN backing for war on a combination of French "intransigence" and Saddam Hussein's refusal to disarm. Deputy Prime Minister John Prescott said: "There are only two options left - either Saddam goes into exile or he is disarmed by force." Number 10 will now fear that opposition to war among backbench Labour MPs will crystallise around Mr Cook - the most senior figure to quit the government over Iraq. The former foreign secretary was flanked by other ex-cabinet members Frank Dobson and Chris Smith as he delivered his personal statement. Amid growing disquiet among his backbenchers, Mr Blair is due to address the Parliamentary Labour Party before leading Tuesday's Iraq debate. A vote will then follow on the government's stance. There had been speculation that International Development Secretary Clare Short, who already threatened to resign, might follow Mr Cook onto the back benches on Monday. But she refused to comment as she left Monday's Cabinet meeting and there have since been mixed messages about her future. Ahead of Tuesday's Commons debate, rebel MPs warn they will table an amendment stating there is no moral justification for war without a new resolution. More Labour MPs than the 122 who voted against the government last time are expected to rebel this time. Ex-Labour whip Graham Allen and a group of MPs, including Mr Smith, have drawn up the amendment. It will say that the case for war has yet to be established "especially given the absence of specific UN authorisation" while simultaneously giving their support to British troops.